Did you ever have a dream where different elements from completely separate parts of your life - a current love, a place you visited as a child, a long-dead relative - suddenly come together in a way that makes perfect sense? This intersectionality best describes the exquisite and immersive experience that is The Lost Supper – A Hypnotic Dinner Party. Taking place at the McKittrick Hotel, home to the legendary Sleep No More, and the soon-returning At The Illusionist’s Table, The Lost Supper is an event that occurs in a missed pocket of time. 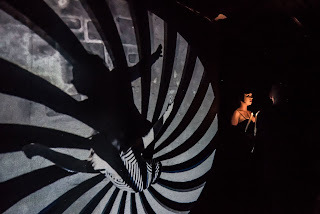 Taking place at The Attic, a newly rediscovered space at the McKittrick, the event begins as guests are led through several different rooms, each of which has a feeling of being somewhat off-kilter. Some rooms provide hints of explanation as to what you are seeing, while others invite conclusions. However, in either case, the line between what is real and what is not becomes increasingly blurred. Inside the main event - a dinner party that takes place in a distinctly mid-20th century supper club slightly out of sync with history - guests are seated by name at pre-arranged tables. Musical numbers from the late 1940s to the early 60s are performed during dinner, which is a three-course meal, with preferences selected at time of ticket purchase - a vegetarian option is offered - served by extremely talented hosts and waiters, who appear both on and off the stage, constantly interacting with guests in a perfectly synchronistic plotline that weaves audience, story and performers together seamlessly. In such an altered atmosphere, what is served really doesn't matter, but many of the menu items are reminiscent of then-trendy food in the 1950s. While there is no formal dress code for The Lost Supper, "festive, chic, costume attire" is suggested. Many guests wore period-appropriate costumes, many were in modern dress, but dressing as the McKittrick suggests will help you blend in better with the performers and hosts, who are a constant presence throughout. At points, guests and performers were nearly indistinguishable as they enjoyed the evening and the dinner party unfolded. Telling too much about The Lost Supper would spoil the delight of being a part of the spectacle that unfolds before your very eyes. In the tradition of events presented at the McKittrick, the more guests chose to participate in spirit of the dinner party, the more fun and interesting it is. Definitely a one-of-a-kind experience, The Lost Supper offers a fascinating peek into a different sense of reality which you will not soon forget. Nor, one might add, should you want to. Reservations are required in advance for all performances. Played by six different actresses and seen at various ages between 12 and 69, Mary Page Marlowe is someone who has gone through/will go through a tremendous of turmoil in her life. 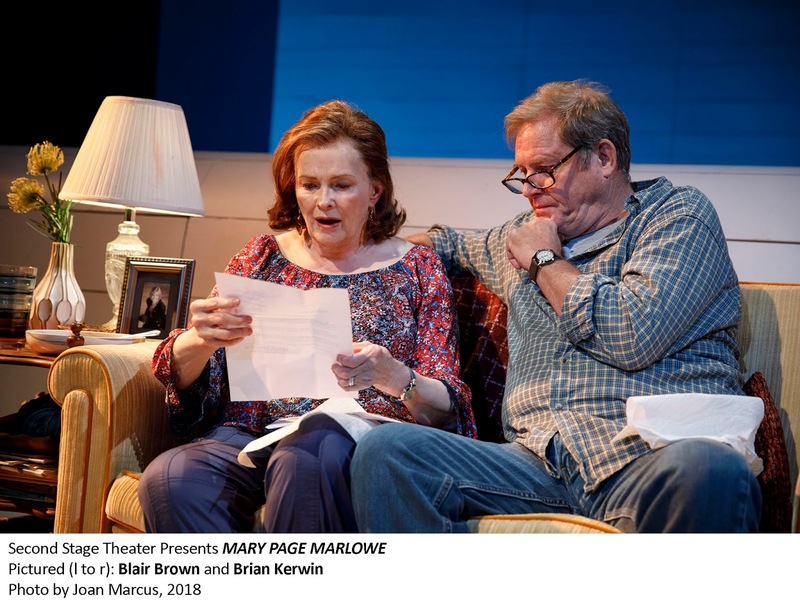 Coming from a broken home and raised by her mother Roberta (Grace Gummer), who's unhappy with how her own life turned out, Mary Page has built up a series of internal defense mechanisms to prevent anyone from getting too close. Those stuck on the outside of these mental structures include her children, Wendy and Louis (Kayli Carter, Ryan Foust), and at least two of her three husbands. Something else Mary Page has erected over the years are practices of denial and enabling. The former in regards to a drinking problem; and the latter when it comes to pleasing her latest bed partner in a string of what she considers to be meaningless affairs. Or acquiescing to her first husband's wishes during their divorce. The underlying irony in Mary Page's actions is that the more she tries to insulate herself from being hurt, the unhappier both she, and those around her become. Her continual attempts to avoid the fate of her mother leading Mary Page to become a very close copy of what she has been running from almost all her life. While various information regarding Mary Page is revealed over the course of the play - including facing jail time for driving while intoxicated; a growing estrangement from her children; and a continual need to rebel against what others expect of her - exactly who Mary Page Marlowe is never gets completely revealed. Then again, for the longest time, Mary Page herself is unable to articulate what causes her to act the way she does. A confession and partial realization in this regard brought forth via an illuminating conversation she has with her Shrink (Marcia DeBonis). Tatiana Maslany playing Mary Page at this point. It’s a testament to Lett's writing that as each segment of the play unfolds, all in a non-linear progression, the audience is continually drawn into a story having no idea of the outcome until the very end. The entire experience akin to trying to fit together an elaborate puzzle. Kudos also to director Lila Neugebauer, who brilliantly succeeds in presenting the work in a way that keeps each succeeding scene relevant to what has come before, and integral to what will occur after. Every one of the actresses playing Mary Page are at the top of their game. Each woman presenting a piece of someone who is totally relatable to the audience, even if we don't understand that character completely. Be it as a teenager (Emma Geer) determined not to just settle down and get married; a 40 year-old (Susan Pourfar) trying to make the best of a bad situation when telling her children that her marriage to their father is over; or a woman in her sixties (Blair Brown) showing the ease and comfortableness she shares with husband number three (Brian Kerwin). Mary Page referring to Kerwin's character as the "best of her husbands". It also helps that the show is peppered with many interesting characters - a number of whom appear for only a single scene. Among them, Mary Page's husband number two (David Aaron Baker) and number three; as well as Ed Marlowe (Nick Dillenburg), Mary Page's father. Dillenburg in particular offers just the right amount of pain coupled with an ominous sense of menace as Ed wrestles with his own demons. All of which makes you want to know more about this character. Kerwin shows an easygoing chemistry with Blair, making their characters' marital status completely believable. 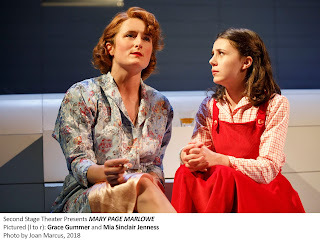 Elsewhere, Gummer is able to reveal enough of Roberta in her scenes to explain why Mary Page's mother turned out the way she did. Also doing a good turn as Mary Page is Mia Sinclair Jenness, the actress playing the character at 12 years old. A child who just wants a word of encouragement from her mom, but ends up getting only backhanded compliments. The connection the audience soon feels with Mary Page also leads to the show's one major misstep. Though Letts has certainly written an interesting story, he's so intent on keeping Mary Page at arm's length from the audience, that he does not finish what he started. Specifically, although we see the root causes of why Mary Page has become the way she is, we never see the moment when she apparently decided to change the direction of her life or how she wound up on the other side. This missing information becomes particularly glaring when taking into account a key moment where Mary Page (Kellie Overbey), explodes at husband number two for daring to accuse her of not being able to feel anything. With the story taking Mary Frances from points a-z (albeit not chronologically), but missing steps p-t, one can't help but feeling somewhat cheated. Also omitted from the story is a more complete understanding of the relationship between Mary Page and Wendy. Fortunately, what is present in the play is more than enough to hold one's interest. The story unfolding in carefully orchestrated bits and pieces, forcing the audience to piece the together the proper timeline while trying their best to fill in the blanks until more information is provided – when it is. The sets by Laura Jellinek, ranging from the various homes of Mary Page, to a psychiatric office and a hospital room, are quite good, as are the costumes by Kaye Voyce. Mary Page Marlow reveals one person's story as shown through the different snapshots of her life. While the end result is not as complete or as satisfying as it could be, the journey to which one is treated is still nicely intriguing. Featuring: David Aaron Baker (Ray), Blair Brown (Mary Page Marlowe, ages 59, 63 & 69), Kayli Carter (Wendy Gilbert), Audrey Corsa (Connie), Marcia DeBonis (Shrink), Nick Dillenburg (Ed Marlowe), Ryan Foust (Louis Gilbert), Tess Frazer (Lorna), Emma Geer (Mary Page Marlowe, age 19), Grace Gummer (Roberta Marlowe), Mia Sinclair Jenness (Mary Page Marlowe, age 12), Brian Kerwin (Andy), Tatiana Maslany (Mary Page Marlowe, ages 27 and 36), Kellie Overbey (Mary Page Marlowe, age 50), Susan Pourfar (Mary Page Marlowe, ages 40 and 44), Maria Elena Ramiez (Nurse), Elliot Villar (Ben), Gary Wilmes (Dan).